Car enthusiasts take pride in restoring their car to mint condition, investing years of meticulous care. That same level of attention extends to the process of starting your vehicle and moving it out of secure car storage. 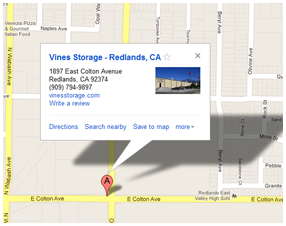 Vines Storage in Redlands is a premier car storage facility, offering owners their choice of secure enclosed outdoor storage or climate-controlled stalls. A state of the art 32-camera surveillance system and keypad entrance adds extra layers of security. Regardless of whether your car is being stored for a few months, or several years, follow these steps to ease your baby back onto road and bring it up to speed. Take a visual walk-around inspection to look for any leaking fluid. Green moisture points to a coolant issue. Red indicates power steering or transmission leakage. A dark colored fluid could be a sign of a differential leak. Change the fluid if the car has not been driven for several months. Also, change the oil and filter and drain, flush, and refill the coolant system. If you did not use a fuel additive product, empty the gas tank and refill with fresh fuel, properly dispose of the old fuel. Make sure the engine hoses are supple and not cracked or spongy. Check the battery, making sure it is holding a sufficient charge and inspect the battery cables, terminals, and posts for signs of corrosion. Change the spark plugs, and while they are removed, pour oil into the cylinders for lubrication, which will smooth the first new firing of the engine. Consider using a tool to spin the oil pump to discharge fresh oil to the bearing surfaces. Inspect brake drums and linings, grease the hubs, and then adjust the brakes to the manufacturer’s specifications. To restart the engine, if the car has a choke, depress the throttle pedal to set it. If your car is injected, turn the key switch to “on” and pump prime for 30 seconds. Let the car gently idle until it gets up to temperature (about 180 degrees). Listen for any out-of-the-ordinary sounds. A ticking could mean a valve adjustment is needed. Have someone assist in a light check to make sure all lights are functioning, including the turn signal and brake lights, headlights and hazard lights. Check air pressure in the tires and inflate as needed. Check the brakes at low speeds in the parking area to ensure proper function before going on roadways. When on the road, be attuned to any rattles or engine hesitation that may need investigation. Once home, recheck the fluid levels, and repair any issues that you may have discovered.